This week's Parashah (Devarim 17: 3) condemns those who "prostrate themselves before the sun or the moon or the army of the heavens [stars, comets, etc.] " The total eclipse of the sun was a very traumatic experience for the pagan believers in the Sun god when their god suddenly disappeared. We are the lucky ones who for millennia have known this truth and see from the eclipse that their so called 'god' is a minor player in God's universe. 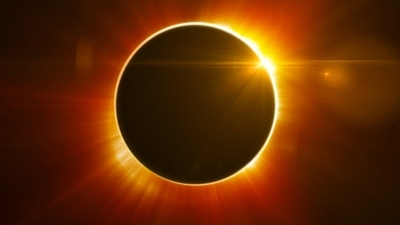 The Talmud (Sukkah 29a) declares: "An eclipse of the sun is a bad omen for the world." Why? It's like a king who made a huge banquet and set up a lantern to illuminate the party. Similarly, this world is a beautiful banquet which God has prepared for us. If the lantern is covered, as in a solar eclipse, it diminishes our enjoyment of the world. and because of two brothers who were murdered together. The Talmud specifies that, among other reasons, the sun is eclipsed when a great rabbi dies and is not eulogized properly. If a society does not grieve properly for a great rabbi, it shows a lack of appreciation for the ethical values that he upholds. This is a bad omen – indicating a society in a state of moral and spiritual decline. The Maharsha (17th century Poland) says that a great rabbi is compared to the sun in that he radiates Torah to the people. For example, the Talmud (Baba Batra 75a) compares the face of Moses to the face of the sun. So a solar eclipse could be called an eclipse of the spiritual sun. The Sages did not institute a blessing upon seeing a solar eclipse. Some suggest that this is due to its negative connotations. Rabbi Tendler in Moreshet Moshe v. 2 p. 51 quotes Rav Moshe Feinstein as explaining that there’s no bracha for seeing a solar or lunar eclipse and in fact it is a negative sign. Shut Aseh Lecha Rav 150 agrees that a beracha should not be recited because no such beracha is mentioned in the Gemara.